What is the best rabbit harness? It comes in two different sizes, it doesn’t restrict your pet’s movement and the leash is stretchy enough to allow your rabbit to run and play around. If you want a harness that you can use daily, and that won't fall apart easily, this might be an excellent choice. 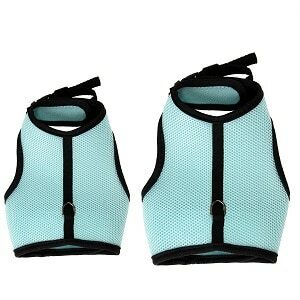 It is an adjustable piece, which comes in vibrant colors, that will let your pet's skin breathe. Moreover, it is made of sturdy fabrics, and the colors are persistent. The only downside two buyers pointed out is that the sizes are not universal and that you can only opt between an L and an M model. Ultimately, the harness can be easily washed and it will feel soft and comfortable around the rabbit's body. It can be put on and taken off with ease, without stressing the furry creature out. Another model that will make it simple for you to walk your rabbit pet and to get it to exercise is this nifty one from UEETEK. The best thing about it is its eye-catching design and the soft polyester it is crafted from. Additionally, the piece comes with an elastic leash. As a setback, past customers thought the fact that because it only comes in pink, it is limiting, as they believe this is a color just for females. This product is a fit choice for those who like to combine style with functionality and a good price. It offers your pet a lot of freedom, and it can be adjusted. Plus, it is washing machine safe. Small, sturdy, and pretty - these are some words that sum it up. It comes in many colors, and it is crafted from a combination of a hard-wearing mesh and nylon. The leash is elastic and 47 inches long, and the piece is a fit choice for a rabbit between three and six pounds. One small flaw that you might not enjoy is the leash it comes with since it's pretty stretchy. The good thing is that you can always replace it. Lastly, you should know it comes with an extra nylon strap that features a snap buckle and that it is adjustable in the chest and stomach areas. This model can be easily cleaned and stored too. This is the top recommendation based on the clients’ opinion. This cute baby blue rabbit harness is everything you will need to take your furry friend out for a walk in the park or your backyard. What we liked the most about this is that the leash set is long enough to offer full freedom of movement for your pet so that he/ she doesn’t feel refrained in any way. This harness is for sale in two different sizes, and the L size will easily fit even the biggest rabbits breeds existing. The product is made from mesh and nylon, breathable yet resistant fabrics to allow your rabbit to run as much as he or she wants without adding too much pressure. Also, the harness comes with an adjustable velcro closure system to always make sure you have the perfect fit for your own pet and his rabbit agility. It is made from lightweight, breathable, and qualitative fabrics to allow perfect fitting for rabbit sizes and breeds. This product is even suitable for rabbits from the Giant Flemish Rabbit. The harness is specifically designed to hold the bunny in a way that prevents slipping out but doesn’t restrict the freedom of movement either. In other words, this product is suitable for whenever you want to let your bunny enjoy freedom without the risk of losing him. The velcro part is steady and doesn’t come undone easily for added security during movements. Last but not least, the harness and leash are easy to control and will not add extra pressure on your little friend’s body or bones. Some of the customers have claimed the design is not as sturdy as it is advertised and may not even fit all rabbit breeds. If you own a big-sized rabbit breed, we do suggest you look for alternative options too. 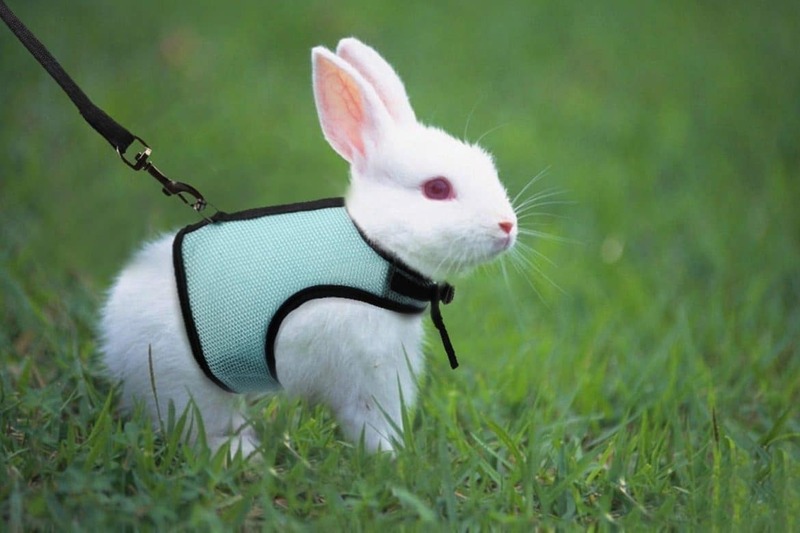 This rabbit harness is a great alternative for whenever you want to take your pet out for a walk and introduce him to the surrounding nature. Although mainly suitable for rabbit girls due to the pink color it comes in, this harness is still a reliable choice for all pet owners. Most of the reviews about this product are positive with people praising its quality and freedom of movement provided for your animal. It is also safe to use, and the velcro closure will provide a more fitted design. 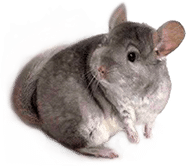 However, make sure to have closely measured your rabbit before ordering this product as this is mainly suitable for animals up to four pounds. If your rabbit belongs to one of the giant breeds like the Great White, we would suggest looking for more reliable alternatives or even choose a harness fitted for cats – only those would be able to handle the rabbit agility. This rabbit carrier was designed using the finest materials – a soft polyester fabric complete with a full elastic leash to allow your bunny to enjoy total freedom and get the nature walk he deserves. The sticky buckle cloth placed on the neck part allows you to adjust the item at chest and stomach for a perfect fitting without choking. You can also adjust the harness to be more snugly around the waist to prevent him from slipping out and running around the park trying to catch your bunny. The price of this item is extremely affordable. Thus we suggest you give it a try. 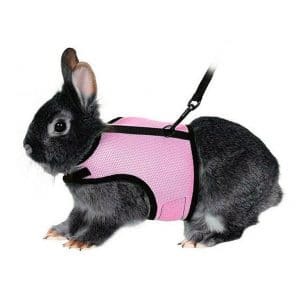 The main disadvantage of this cute pink harness is that it is crafted to fit small-sized rabbits, between 1.5 and 4 pounds. If you have a small-sized breed, this won’t be a problem because the harness will perfectly adjust. On the other hand, if your furry fellow is part of the larger rabbit breeds, you may have to search for additional items suitable for his size and needs. Out of the three products Mr. Fox reviewed in this article, this one is the most affordable. If you plan on taking your fellow out of his rabbit hutch for a quick walk in your garden or the nearest park, this item should strike your interest. What we liked the most is that you can purchase the harness in a wide variety of colors or you can choose two items of separate colors delivered as a set. However, you have to consider the fact that this harness is also made for smaller rabbit breeds, between three and six pounds. The product also received numerous positive reviews from the customers who said it is easy and safe to use, while the design is strong and durable (so it won’t easily break). But make sure your bunny likes to be strapped up before using the harness on a real park walk. Some rabbits are animals that do not stand to have any accessories on them, so it may be a little more difficult to convince them to stay in a tight harness. The product comes in three different colors, from pink to black and blue and it is made from a soft combination of fabrics – mesh and nylon, to provide a comfortable yet lightweight and durable wearing. The soft padding of this harness makes it even more comfortable for your bunny to wear even for extended periods of time. It provides an extra nylon strap with a snap buckle for easy fitting and adjusting around the neck and the stomach. You can attach any type of leash you want to the harness if the one provided doesn’t suit your pet. Unfortunately, this strap too is mainly made for small-sized bunny breeds, between 3 and 6 pounds. If your furry fellow is larger than that, we have to suggest looking for additional products more suitable for his weight and height. Another negative aspect that some of the customers mentioned about this harness is that the leash is rather short, so don’t expect to give your bunny too much freedom when going out. Finding the right harness for your bunny is not an easy task, although there are plenty of products available on the market. You have to consider a wide variety of aspects for your rabbit’s safety and comfort. Luckily for you, we have put down the main aspects you should take into consideration when looking for such items so that you can always be sure you have made the right choice. The most important aspect to look for in a rabbit harness is the safeness it provides both for your and for your pet. They have to feature secure locking systems to prevent your rabbit from escaping the harness or you losing him on the way to the park. Keep in mind that bunnies can run fast and, once escaped, it may be hard to impossible to find your bunny back. Not to mention all the dangers you are exposing your rabbit towards if he gets unleashed in an environment he is not familiar with. Thus, we suggest you look for harnesses with velcro closing systems and adjustable buckle straps and meshes to make sure you find the perfect fit for your pet. Depending on your preferences or your pet’s preferences, you can choose between multiple styles of harnesses. There are the full ones mainly made from mesh and polyester which look more like a coat and provide full support for the neck and the tummy, or you can choose the straps type which provides more freedom of movement. It is mainly a matter of personal tastes and preferences as all these types of harnesses come with their own perks and negative aspects. Obviously, during the hot summer days when your bunny finds it difficult to even get out of his rabbit bedding, adding a harness made of mesh and polyester may be too much, so you should take into consideration a more lightweight type of item. Although this aspect mainly refers to the personal preferences of the owner and not the pet itself, you should know there are plenty of designs and color schemes to choose from when looking for the perfect bunny carrier. We do think that a brighter full harness, in a colorful print or pattern would be more suitable because it can be easily identified, especially if you plan on taking your rabbit in a populated park. This way, even though you let go of the harness and leash, you can easily spot your furry bundle of the joy in the crowd. Last but not least, also consider the fabrics used for manufacturing the rabbit harness. If your rabbit has sensitive skin or is easily annoyed by any accessories or garments you put on you may want to look for super-soft harnesses made from the finest and most luxurious fabrics. Silk or cotton could prove excellent choices, but these are rather expensive and will not keep your bunny safe. On the other hand, full harnesses are mainly made from mesh and polyester fibers to ensure good ventilation and offer full support to your rabbit. These items are mainly breathable but could add extra pressure and lower the ability to move freely if they do not come in the right fit.